NECKLACE - SARAH COVENTRY. "LOVE STORY" INTRODUCED IN 1973. 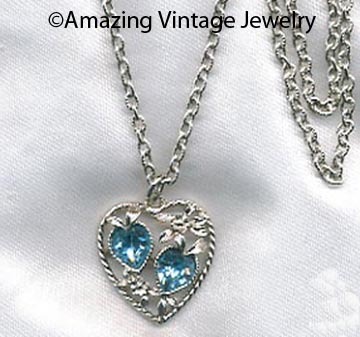 SILVERTONE HEART WITH 2 AQUAMARINE-COLORED RHINESTONES - BIRTHSTONE FOR MARCH. PENDANT IS 1 1/4" LONG, 1" ACROSS. CHAIN IS ALMOST 22" LONG. VERY GOOD CONDITION.